Opportunity often has an ambiguously foreboding knock. One such call presented itself as silence one night while I was playing Red Dead Redemption. The game repeatedly froze, but I, disheartened and in a state of denial, kept pressing on ... rebooting. I knew the symptom all too well however, having succumbed to system failure twice before, and eventually got the infamously dreaded (though not at all unexpected) “Red Ring of Death” for the third time on my first-generation Xbox 360. This time, however, it happened outside of the Microsoft-extended warranty. 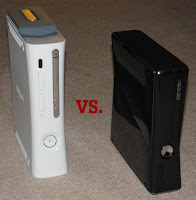 Luckily, Microsoft had just launched the new Xbox 360 S — let's just call it the 360 Slim — which promised all sorts of goodies in addition to a sleeker profile and a return to the namesake's black aesthetic. Those replacing their first-gen Xbox 360 with the 360 Slim get one hell of a deal. For $300, you get a Kinect-ready system with an internal 250 GB HDD (hard disk drive); standard HDMI and component ports; five, count 'em, five USB 2.0 ports; internal wireless modem; "whisper-quiet" operation; and better built-in cooling. Even though more dedicated gamers might have already bought the swappable 120 or 250 GB HDD, upgraded to the HDMI-capable second-gen or Elite systems, or don't care about abundant USB connectivity, there are still 2 features which make the 360 Slim an undeniable must-buy: its noiselessness and overheating warning. Where once I had to turn my sound system up to be able to ignore the whir of the spinning disc as I played Rock Band, now I only voluntarily turn the volume up to relish the sounds of slaughter as I hack and slash my way through Ninja Gaiden II. The noise while playing disc-based games is more than a whisper, but the decibel level is definitely diminished compared to older system incarnations. When watching streamed or downloaded content via Xbox Live and Netflix, there is virtually no sound, and that alone is worth the $300 price tag of the 360 Slim. There is, however, another bundled essential: the 360 Slim offers proactive protection against conditions that would bring about the infamous red ring of its predecessor. Specifically, an additional heat sink as well as a message that pops up warning of "insufficient ventilation." So no matter how long you play, the console lets the gamer know if it's too taxed. How conscientious and wallet-saving! The aforementioned features do not at all downplay the value of the supplemental USB ports for Rock Band peripherals, external storage, portable media devices, and chargers; the additional standardized memory for downloaded audio, video, and game content afforded by the spacious 250 GB HDD; or the data transfer speed and subsequent video quality enhancement of the HDMI . Somewhat ambiguous, however, is the internal nature of both the wireless adapter and HDD. Internal always spells trouble in the same way those old TV/VCR combos spelled trouble: if one breaks, the owner is suddenly without both. Luckily, the 360 Slim does support a separately sold 250 GB HDD in case the integral drive fails or more storage is required. This review is based on a retail copy of the console, purchased by the reviewer.